The marquis game will take place at Rupp Arena in Lexington where No. 8 Kentucky plays host to No. 9 Kansas. Another contest involving ranked teams will occur at the Pavilion in Oxford as No. 20 Ole Miss meets No. 24 Iowa State. LSU is not taking part in the SEC/Big XII Challenge for a second straight season. Simply put, the Tigers did not make the cut. Two seasons ago, LSU went 2-16 in the SEC. So, LSU was not deemed good enough to participate in the event. Therefore, LSU will be involved in a league matchup Saturday – traveling to Columbia for a game against Missouri at Mizzou Arena (5 p.m. Central/SEC Network). The other conference game has Auburn visiting Mississippi State. To illustrate how quickly fortunes can change in college basketball, three ranked SEC teams – LSU, Auburn and Mississippi State – were not placed in the SEC/Big XII Challenge field for 2018-19. 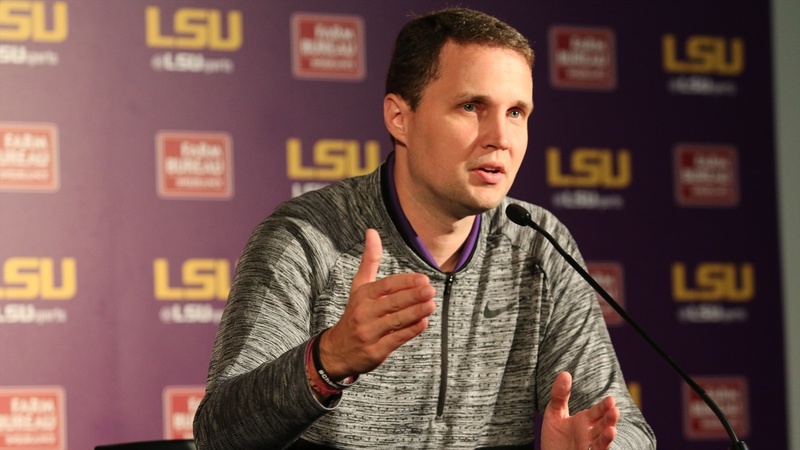 LSU coach Will Wade certainly would like for his team to be squaring off against a Big XII club Saturday. Of course, Missouri is what’s on Wade’s mind. LSU has the opportunity to move into a tie for first place with Tennessee, which plays West Virginia on Saturday, by winning at Missouri. LSU has not won its first six SEC games in 13 years. The only other time in the last 50 seasons LSU started off league play with six straight victories was 1981. Missouri has won just one of its first five conference games with all four of its defeats coming by at least ten points. Missouri’s one SEC victory came at Texas A&M. In its two home league games, Missouri lost by 24 points to Tennessee and by 10 points to Alabama. Wade has his motivational spiel ready for the LSU players. Wade was concerned about his team’s defensive work in the 92-82 victory against Georgia. The Bulldogs shot 54 percent from the field, including 47 percent on 3-point shots. Missouri is the best 3-point shooting team in the SEC at 39 percent. “We played pretty good defense for 27 minutes,” Wade said. “That is not going to get it done against good teams. We have to be able to sustain what we are doing on defense for longer stretches of time. Missouri only has two players averaging 10 points per game – point guard Jordan Geist (13.3) and wing Mark Smith (12.6). Missouri’s best performer has been 6-foot-10 post player Jeremiah Tilmon who is averaging 9.9 points and 5.8 rebounds per game. Even though LSU is off to a 5-0 conference start, Wade is stressing that much improvement is still needed.